4 star, ground floor apartment with cottage feel. 4.5 miles from Stratford-upon-Avon. 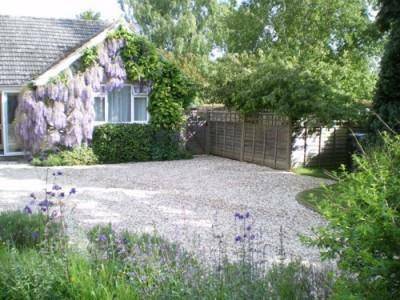 (Bidford-on-Avon 1.5 miles) for 2 people. King size bed, Bath, 2 showers.. Fully equipped including towells, linen and heating. Own private garden with access to owners extensive grounds. Ideal location for walking, golf, nature and culture! This accommodation, which has retained its 4 star rating by Visit Britain, presents an attractive ground floor apartment for 2 persons, which runs alongside the owners main house, overlooking the front & rear gardens. It has its own private patio & lawned garden with trees & shrubs with the additional private walk which is accessed from the gardens. Set in the countryside but within easy reach of Stratford-upon-Avon, Warwick, Birmingham, and the beautiful Cotswold Hills and villages, Little Have offers relaxation and privacy, many choices of amazing restaurants, local pubs, the Theatre, and much more. Lounge: With double patio doors to garden. Two comfortable reclining chairs, wall mounted Flat screen TV and DVD Player. Dining table/chairs. Wireless connection for computers. Bedroom: King size bed with Egyptian cotton bed linen. Fitted wardrobes, dressing/writing table, independent electric shower. Hair Dryer. Bathroom: Fully tiled, has a thermostatic shower over bath, vanity unit and toilet. Private patio: The attractive, private patio area has many planted flowering tubs, garden table/chairs, 2 sun loungers, a lawn with Silver Birch and Ornamental flowering apple tree.